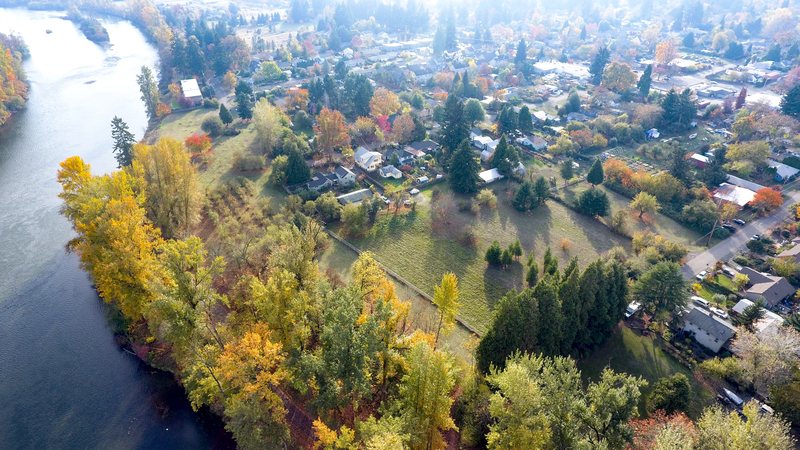 Oakleigh Meadow Cohousing will be built on 2.3 acres of land situated on the beautiful Willamette River in Eugene, Oregon. The city bike path system connects us to nearby parks and a regional shopping mall, including a movie complex. Restaurants and shops are within walking distance. We value our River Road neighbors and strive to build and maintain close friendly relationships with them. Take a tour of how we decided on the layout of the site. Parking is on the periphery of our property, a common house in the middle, individually owned homes close enough to promote interaction, a garden, meandering paths, and private backyards. 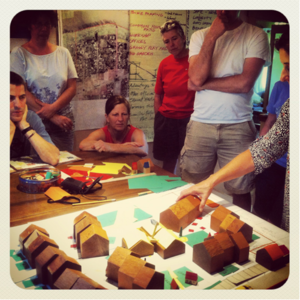 Take a tour of our common house design, it’s the result of a 3-day workshop and many wonderful ideas. This is the heart of the community. A vibrant common house really matters so we put a lot of energy into designing something that really works. 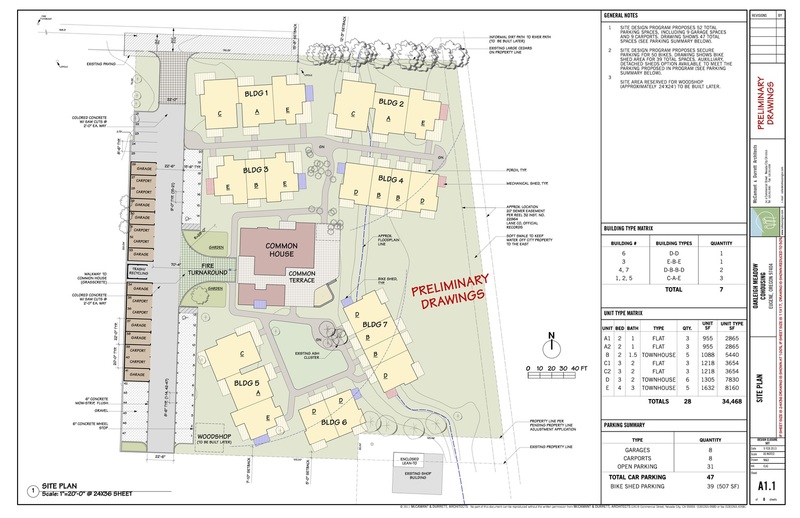 This document is the Oakleigh Meadow Cohousing Group’s program and design criteria for the schematic design of their Common House. It summarizes the desired activities, priorities and design criteria agreed to by the resident group during a programming workshop facilitated by Chuck Durrett of McCamant & Durrett Architects in October 2012. Program write-up by Jocelynn Cambier, McCamant & Durrett Architects. This program serves a variety of uses:• As the project evolves, this program acts as a summary of the interests and design priorities of the Group. • As new members join the resident Group, it should be used to familiarize incoming, new residents with the desired outcome for the Common House design. • This document represents the combined efforts of the future residents and is a deliberate process culminating in a program design criteria for the Common House that reflects the Group as a whole. • Finally, it shows where there are overlapping interests, common concerns, shared values, and community; where working together makes every individual’s life easier, more convenient, more practical, more economic, more interesting and more fun; and where individually and collectively it is obviously easier to live life lighter on the planet. We are very proud of all of the hard work that went into this, if you would like to see it please contact us and we can share it with you. 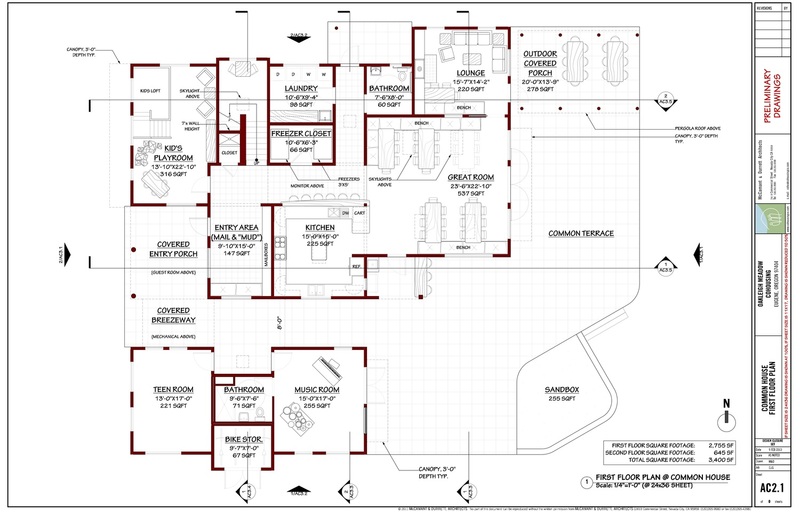 Don’t forget about the individual homes, and we have five floor plans. Typical cohousers want to know their neighbors and share resources, but they still want to own their very own homes, complete with kitchens. Our Private Home Workshop progressed the design process along. We chose goals as a group and then designed our individual units by grouping with households with the same unit type. We then produced a program that Charles Durrett used to design the individual units. This is an excerpt from the program. In western terms, house areas come in three types: functional (living room, kitchen, etc. ), circulation (hallways) and access (an area, say, in front of a bookshelf). In open floor plans, rooms often have all three characteristics — making them feel more gracious. An open floor plan saves space by creating areas that can have multiple uses. 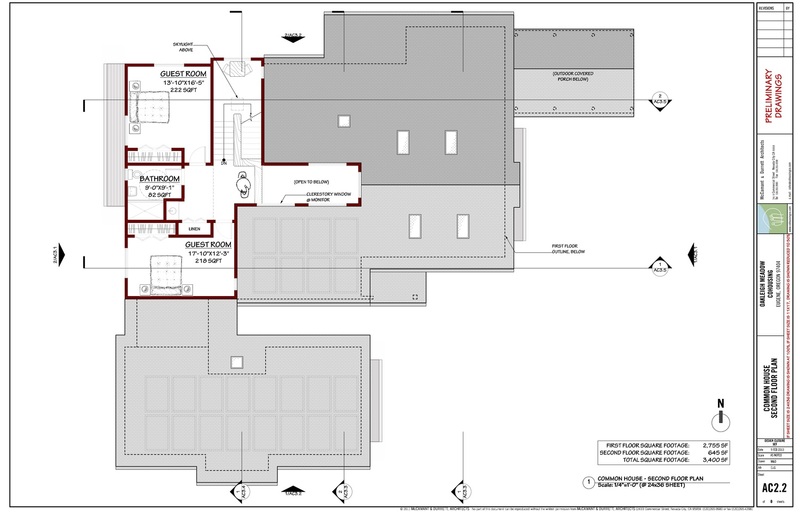 Spaces for circulation may be used for gathering and activities may be expanded to other “rooms”. Outdoor spaces, like the front porch and windows between indoor and outdoor space, help small, interior rooms feel larger than they really are. Moveable furniture can be used to create semi-separate open spaces. All-room concept: The kitchen, dining and living room are to be open and easy to communicate between. It is the ability to “borrow” space from the adjacent room(s) that makes smaller spaces feel more generous. Various methods can then be used to personalize and create hierarchy within the open plan. Rugs provide no physical separation but significant visual differentiation. Furniture will start to separate the space physically. Floor-to-ceiling casework can be used to close off an area almost completely. Custom woodwork can warm up any environment — even an already warm one! The all-room provides maximum flexibility for a diverse range of personal styles and uses.